Our examinations for senior cats (ages 7 and older) are designed for older pet needs; they ensure that your aging feline friend remains happy, healthy, and as pain-free as possible. Between seven and twelve years of age, most cats begin to show signs of age-related problems. They become less active, move a bit more slowly, and are less interested in playtime. It may be apparent that their senses – such as hearing and seeing – are not as strong as when they were younger. 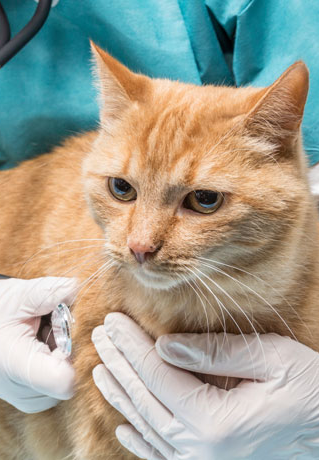 Senior cats should be taken to your veterinarian for an exam at least twice a year; this allows him or her to measure any differences in health that may indicate the development of various problems. If disorders are dealt with quickly, it helps to delay or decrease the odds of more serious outcomes. Detection of disease at an early stage means early treatment. Risk factors can be recognized and controlled quickly. With regular treatment, the progress of a disease can be delayed or halted. If your pet is in pain, there are various ways of reducing or eliminating the discomfort. If obesity is causing problems for your pet, we will help you to control his or her weight. Problems with teeth or gums can affect your pet’s ability to eat healthy food. Kittens and cats do their best to conceal any physical problems. Early detection during an examination can often save your pet from unnecessary suffering, and save you money with early treatment. Our veterinarians will examine your aging pet with care and look for any signs of illness or disease. We will find out and let you know if he or she needs help with an illness, or is eating less because he or she has dental problems. Many treatments are available for elderly, arthritic cats who suffer with painful joints, a common problem. If your cat needs treatment for arthritis, we will monitor the progress of this disease and adjust the treatments when necessary to keep your pet moving happily and free from pain. To learn more about senior cat care and how we can help keep your pet happy and fit, visit our clinic, or call and discuss your concerns at: 3995 Hastings Street, Burnaby, BC, V5C 2H8; or phone: 604-291-6666.